Homemade chocolate cake with a creamy smooth chocolate ganache frosting. This rich and delicious cake is a chocolate lover's dream with extra ganache drizzled on top for a special touch. Preheat oven to 350 degrees F. Grease the bottom and sides of a 9-inch round cake pan. Line the bottom with parchment paper; grease top of parchment paper. Dust with cocoa powder. Sift the cocoa powder into a separate bowl. Boil the water and then add it to the cocoa powder. Whisk until thoroughly mixed. Mixture will be similar to melted chocolate; set aside. In a large mixing bowl, beat the eggs and sugar together until light and fluffy. This may take 2 or 3 minutes. Add the softened butter and mix until thoroughly blended. Using the mixer on low speed beat in the cocoa and water mixture just until blended. Continuing on low speed, mix in the buttermilk and vanilla, just until blended. Do not overbeat. Slowly add in the remaining dry ingredients, again mixing only until blended. Pour batter into prepared pans and level the top. Bake for approximately 35 minutes or until a toothpick poked in the middle comes out clean. Remove from the oven, place on a cooling rack, and allow the cake to cool completely in the pan before removing. 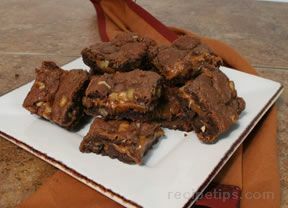 Chop chocolate into small pieces so that it will melt faster. Place in a medium heatproof bowl. Place the whipping cream and butter in a small saucepan and heat just to a boil; remove from the heat and pour over the chocolate pieces. Allow the mixture to stand for a couple of minutes and then slowly stir until smooth and well blended. Be sure to stir mixture gently so that you do not cause air bubbles to form in the ganache. Place the cake, bottom side up, on a wire rack over a cookie sheet. Brush off excess crumbs from the surface of the cake. 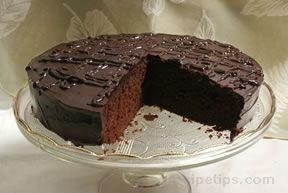 Pour several tablespoons of the ganache on the top of the cake and spread a thin layer over the top and sides of the cake to provide a crumb coating; place the cake in the refrigerator for 5 minutes to allow the crumb coat to set. Then begin adding the ganache to the top of the cake and with a long metal spatula spread it out towards the edge of the cake. Allow it to run down the sides and then spread it out so it covers the sides evenly. Allow excess will drip into the cookie sheet. 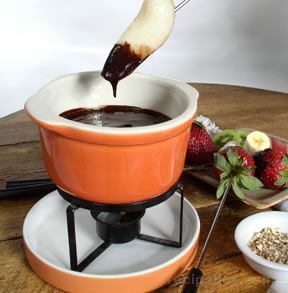 Pour more ganache on the top as needed until the sides are coated and the top is covered and smoothed out evenly. 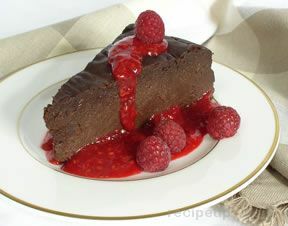 Again, place the cake in the refrigerator for 10 to 15 minutes to allow the ganache to set up. Meanwhile, place a couple of tablespoons of leftover ganache in a small sealable bag and melt in the microwave for about 10 seconds. Remove the cake from the refrigerator, clip the corner of the bag and squeeze the ganache out and drizzle over the top of the cake. "I used the ganache frosting recipe from this cake to use as my frosting for the Wacky Cake recipe on this site. I didn't have any heavy cream at home so I used melted ice cream. It turned out great! It was so creamy and scrumptious. I will use melted ice cream from now on."